All three major broadcast networks broke into programming Thursday morning, Sept. 27 to provide live, ongoing overage of the Brett Kavanaugh hearing where the Supreme Court nominee and one of the women accusing him of sexual assault, Christine Blasey Ford, will testify before a congressional committee. In some markets, NBC broke in at around 9:30 a.m. eastern, covering the last half hour of “Today,” on tape delay, in the central time zone, where it was only 8:30 a.m.
NBC’s special report featured its normal open followed by a hearing branded graphic before cutting to Savannah Guthrie and Lester Holt joined by Megyn Kelly, Chuck Todd and Andrea Mitchell reporting from New York City. The trio sat behind a round table in Studio 1A, the normal home of “Today,” in front of the studio’s 40-foot video wall with a matching mostly textural background loop animation. CBS News broke in with what it labeled “special coverage” at 10 a.m. eastern. 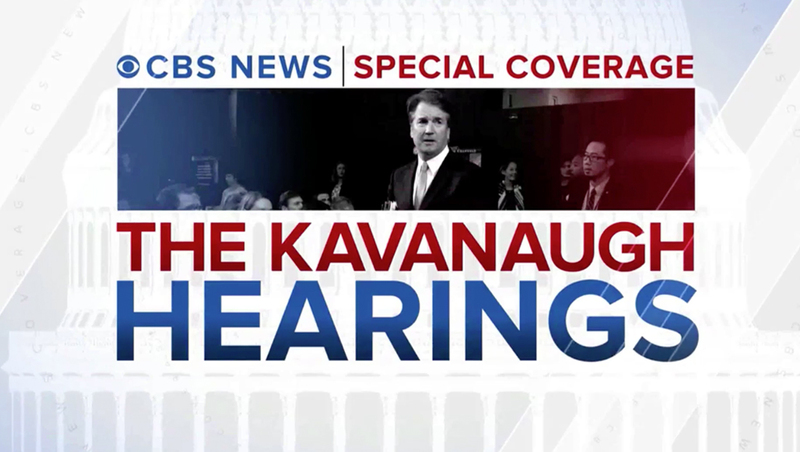 Using the Washington, D.C. studio normally used by “Face the Nation,” “CBS This Morning” anchors Gayle King, John Dickerson and Norah O’Donnell provided coverage, with the studio’s video walls and panels showing Kavanaugh and generic CBS News graphics. CBS also used a special bug in the lower left. ABC News used the first part of its normal special report open, before switching to some of its wordiest branding yet.